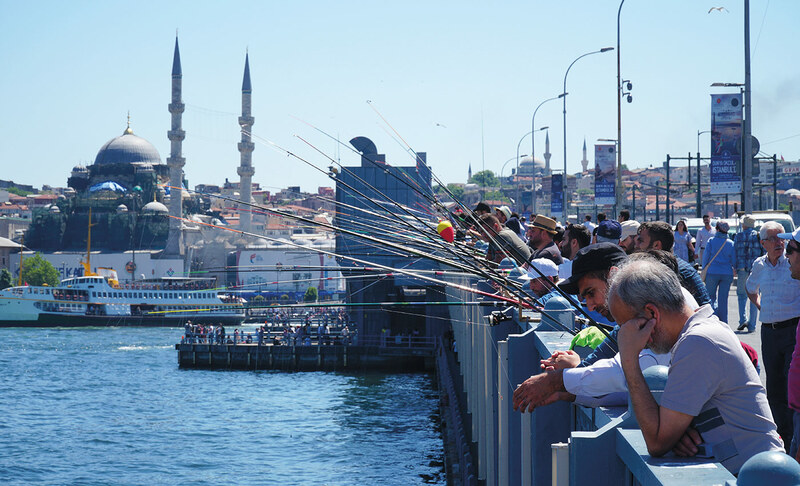 Vibrant cities like Istanbul, picturesque beaches like in Çeşme, unique nature like in Cappadocia. Turkey has it all! After leaving the Balkans we were curious about Turkey. The first thing that caught our attention after entering the country was the big mosque where a muezzin was loudly inviting people to pray. 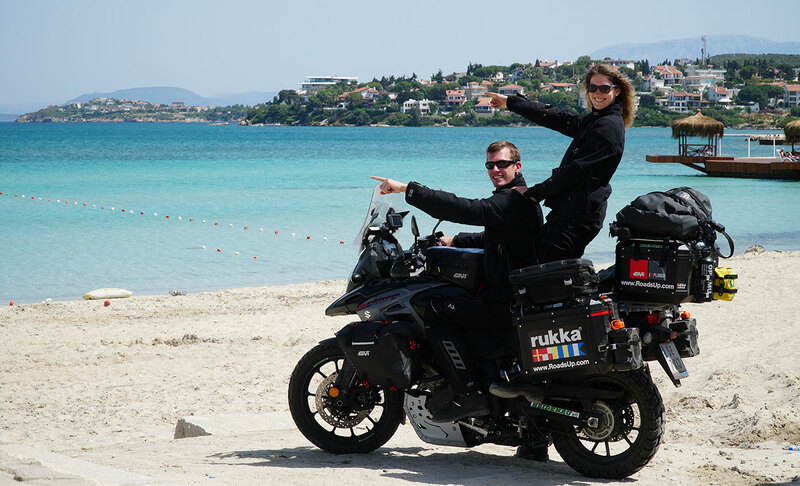 On our way to Istanbul we took a break to drink some coffee when we saw another fully packed motorcycle approaching. 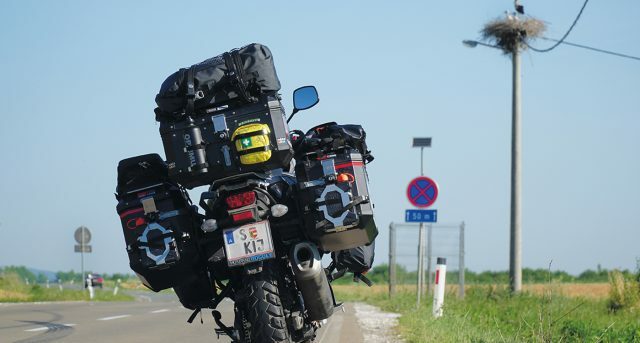 John, the rider, was a cool guy from Boston who bought his bike in Albania and found some creative fast solution to pack his stuff like installing a big basket at the front. Arriving in Istanbul took a bit longer than expected because of the heavy traffic. Veysel, an awesome motorbiker invited us via couchsurfing to stay at his place. He greeted us from his window and went down to meet us. After sweating for hours in the slow-moving traffic of Istanbul we felt like in heaven when we entered the tastefully furnished flat and drank a cool drink together. Afterwards he showed us around İstiklâl Caddesi, one of the most famous avenues in Istanbul and took us to a rooftop bar where we had a spectacular view over the old city center. We visited the famous Galatatower, called Galata kulesi in Turkey. It was illuminated in different colors and looked amazing. After returning home we ordered some Turkish food and had lots of fun with Veysel and his friend, a motorcyclist who joined us later. 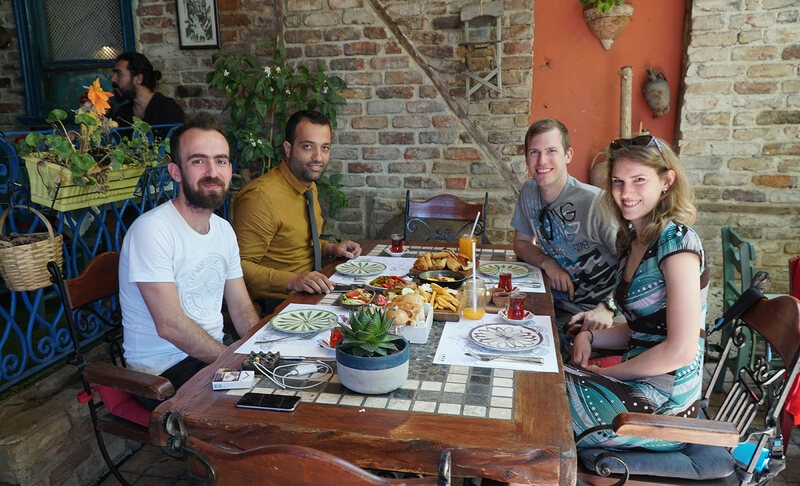 On the next day the four of us went to a nice café viewing the Bosporus and ate some delicious Turkish breakfast. As they had some other plans for the day, the two of us took off for some sightseeing in the old European part of the city. 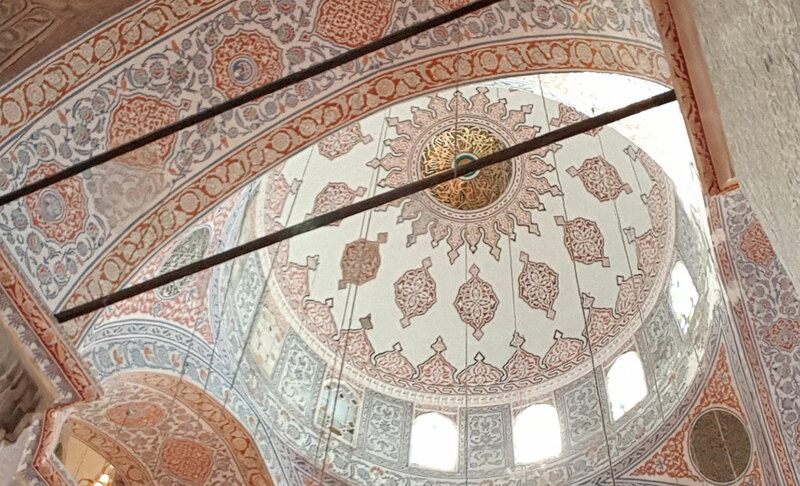 We visited the Blue Mosque and the beautiful park full of palm trees of the Hagia Sophia. On the way we ate some baclava, a sticky sweet candy that tastes amazing. 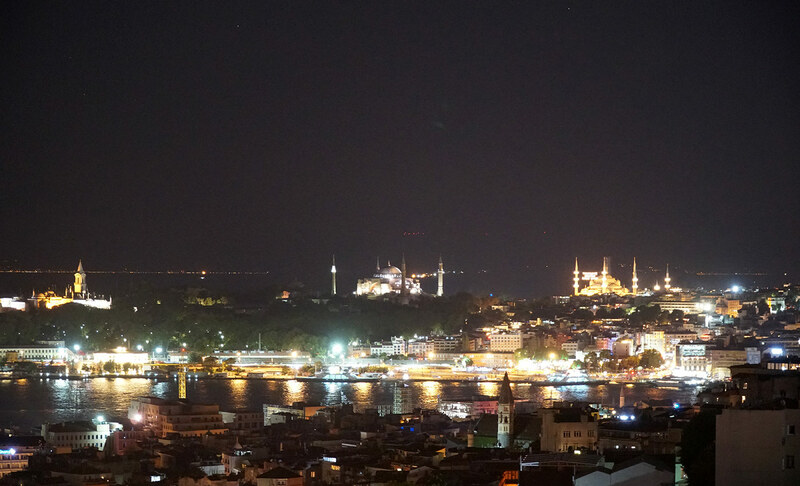 The day ended much too fast and on the way home we admired the nightly skyline glittering in the water of the Bosporus. 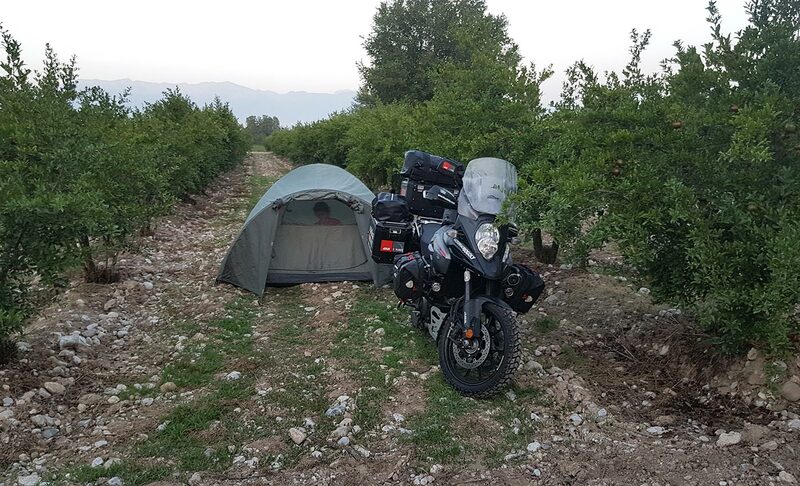 Deciding to go to the beach we left southwards to Çeşme near Izmir and found a nice camping spot between pomegranate trees. We`ll remember the following day as one of the best from our journey so far because we met so many wonderful people in Turkey. 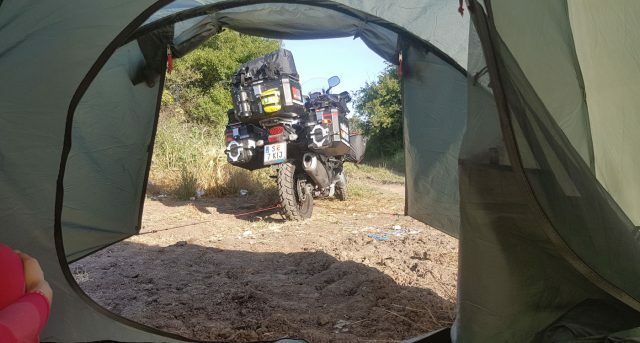 In the morning after packing our tent a very small bike came around leaving a trail of dust and stopped at our sight. A guy with a red turban asked us if we wanted to have some tea with him. As he looked very friendly and we always liked to drink some tea in the morning we gladly accepted the invitation and rode behind him on the earthy road. 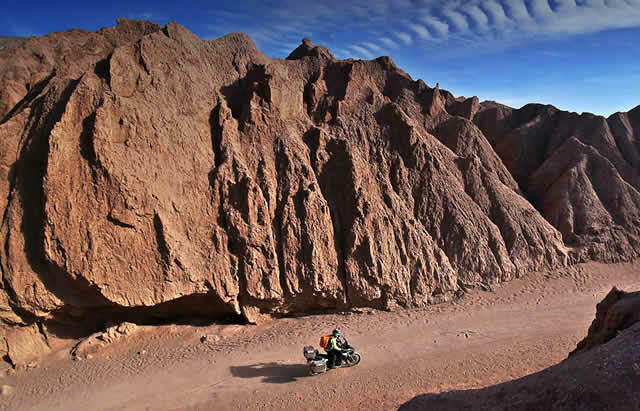 The bike was heavily shaking under the unpaved and stony road as we followed him into the unknown. Where would he take us? On the way he stopped to pick up another guy and the four of us arrived at a small café. A few other men already sat there smoking and drinking tea. Everyone was really interested in the bike and our trip. We had a nice time sitting there trying to communicate. After exchanging many stories talking with our hands and drawing with an old pen in our tiny notebook Mehmet, the one who had invited us brought us back to the main street. 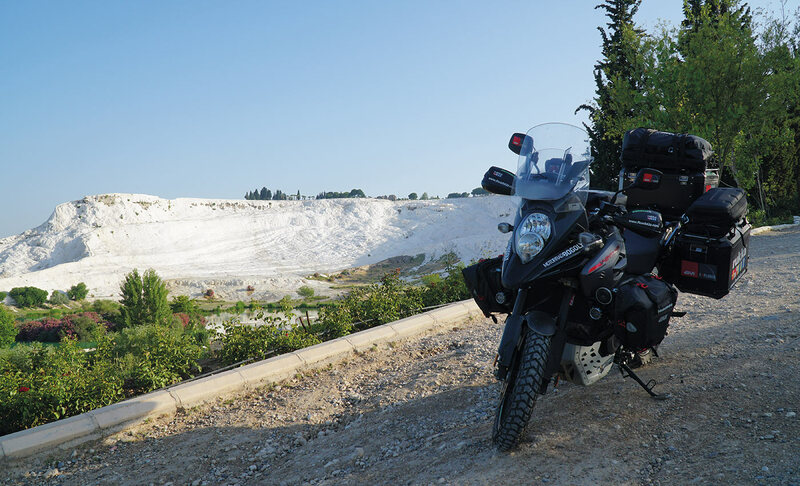 We continued our way towards Çeşme enjoying the nice scenery as a police car stopped us. 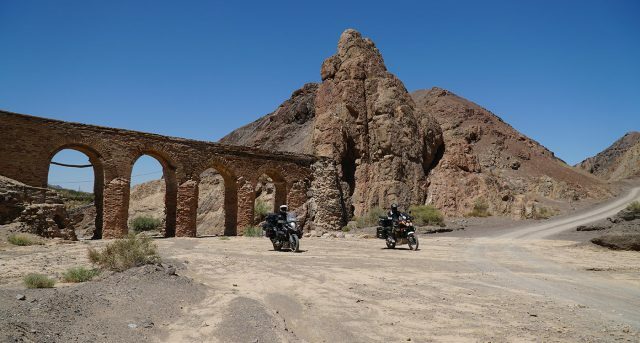 The man told us that we`ve been a little too fast and we should pay 90 euro converted from Turkish lira. It so happened that there was another car stopped by the police and the driver notices us being fined. We started talking and told them about our journey and how we mostly sleep in the tent to save money. At first they tried talking to the police to lower the price without success. Then they just gave us a bunch of money and told us to go to the bank with it. We didn`t really understand what was going on first but then he told us he would pay the fine for us because he liked the idea of our trip. It had to be paid at the bank. We were really baffled and didn`t know what to say so we just thanked him and left slowly realizing what had just happened. At that moment after the police had stopped us we had more money than before. It was a crazy feeling. Soon afterwards we reached the beautiful seacoast and decided to drink some coffee in a nice restaurant to enjoy the picturesque view while surfing on the internet. After some time we got into a conversation with a friendly guy named Batıkan who invited us to stay at his place for the night. We accepted thankfully and wanted to pay for our coffee as the waiter told us that the guy had already done it before. Following his car we came to a nice house with a neat garden where his lovely wife Zeynep as well as two cute dogs greeted us. We happily agreed to their offer to go to the beach together. The next few hours went away too fast for our liking as we were swimming in the glittering sea of a perfect sand beach and enjoyed the company of our new friends. In the evening we grilled some fish in their garden and had a delicious dinner together. 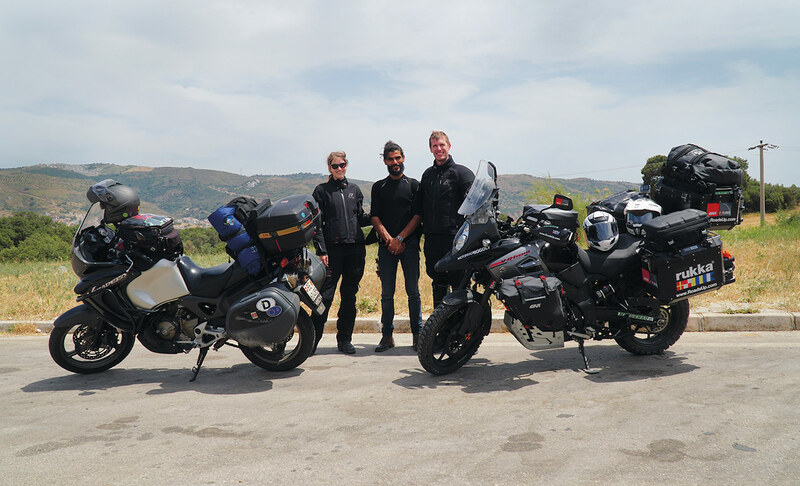 On the following day we wanted to go to Chios by ferry but upon arrival they didn`t let us enter with the bike so we changed our plan and decided to visit Ephesos, an ancient Greek city. On our way on the highway another big motorcycle with high speed passed us. On the next gas station we saw the same Honda Varadero again with its driver. 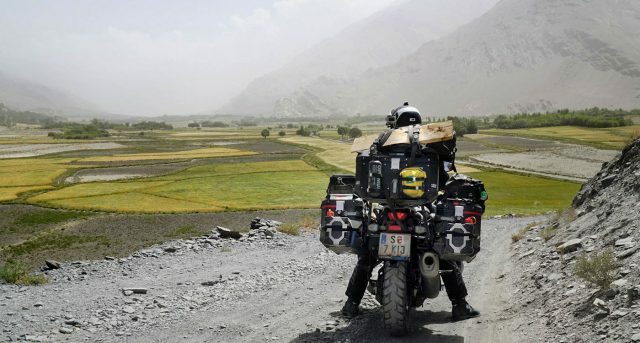 Originally from Tunisia, he was living in Switzerland and was on his way to Mekka in Saudi Arabia with his motorcycle. 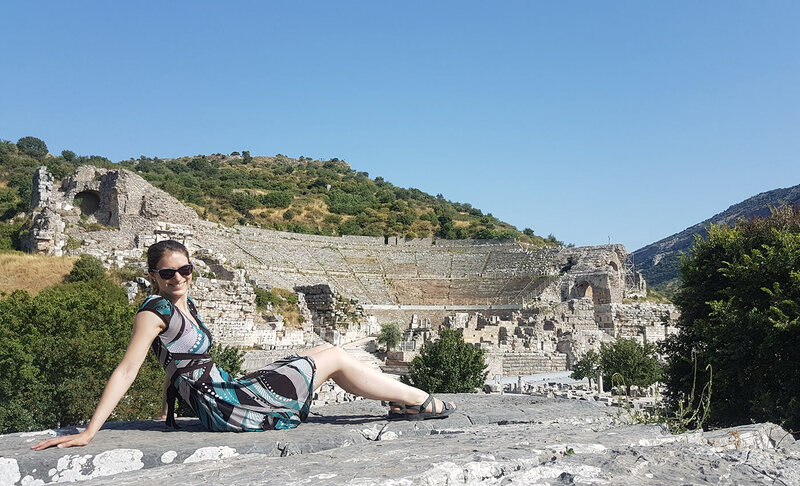 We told him our plan to visit Ephesos and he spontaneously decided to accompany us. 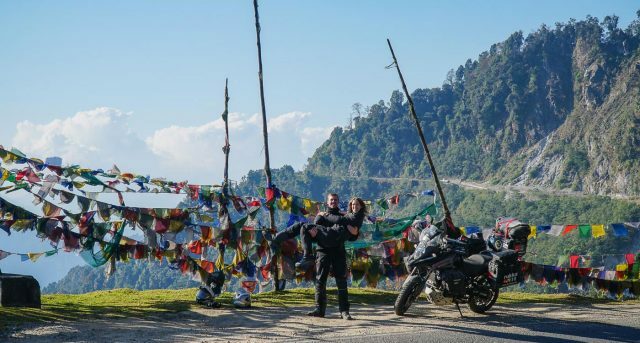 Together we went on the highway where we experienced how fast a motorcycle could possibly go as he passed us from time to time to go zigzag and stopped abruptly a few times. Finally reaching Ephesos we exchanged contacts as he took our phone to write the name “King” over his number explaining to us that there are only two kinds of people in the world: kings and slaves. As he took a leave he predicted that we will read in the newspapers about him later. Sadly it became true as a few weeks later he sent us a message that he didn`t reach Mekka, because he had an accident. 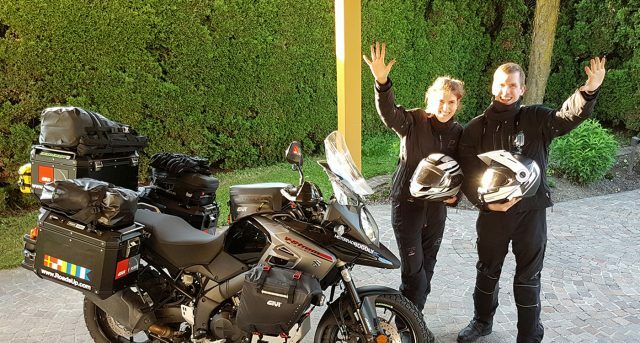 On our way back we met a friendly Spanish couple with a big travel motorcycle parked next to ours with the same Heidenau tires. 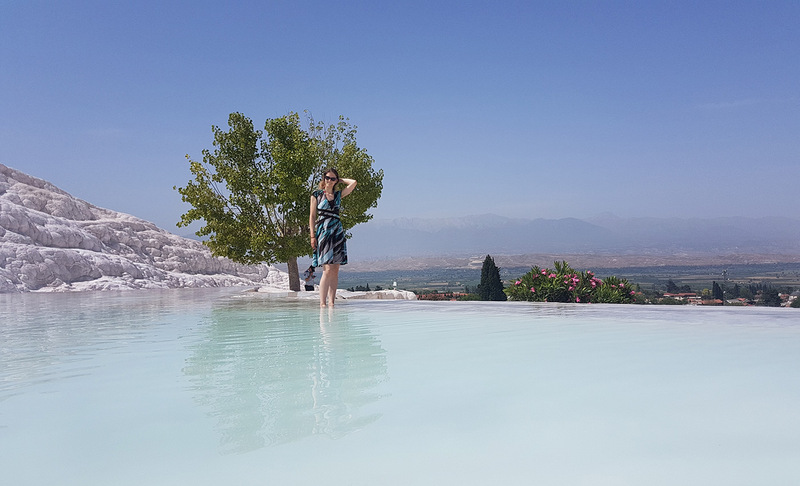 Our next destination was Pamukkale, literally “cotton castle” in Turkish, a hot spring with brilliantly white calcium-coated cliffs and pools. To avoid groups of tourists we decided to visit in the early morning. It was the right decision as we could enjoy the beautiful white terraces with glittering water nearly alone. To find some traditional Turkish food wasn`t that easy as we thought. There were quite a few restaurants only serving Chinese dishes. Back at our motorcycle we were delighted to see the exact same Spanish motorcyclists from the day before. The next destination was Cappadocia. 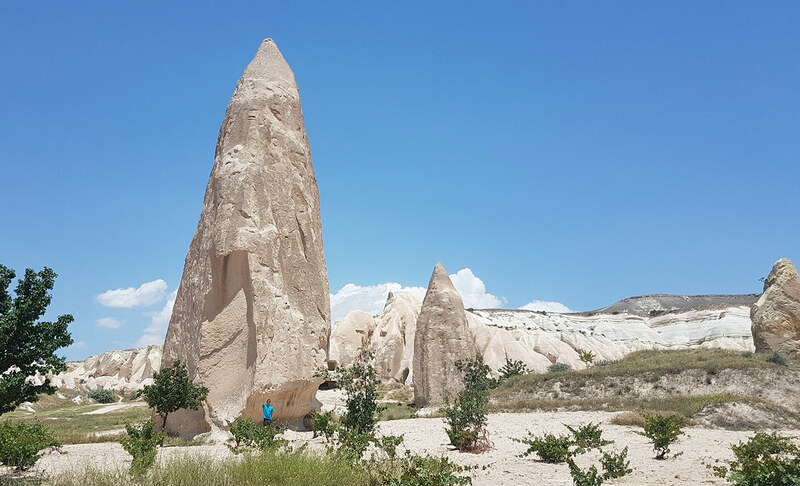 With its unique rock formations, valleys and canyons it is a place everyone should visit when being in Turkey. 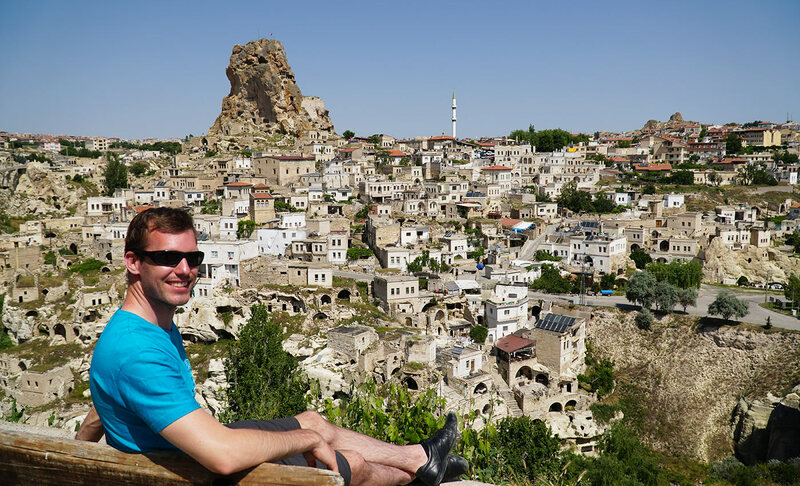 We arrived around midnight in Göreme and pitched our tent on a hill with an amazing view over the city. Our sleep only lasted until three in the morning, because we had booked one of the famous air balloon flights over the region. Arriving on the meeting point a tiny bus took us to a hotel where already a group of mostly Asian tourist was waiting. After wild camping, we did not quite fit into the crowd of fancy hotel guests. Drinking a cup of coffee and eating some cookies lifted our spirits when another bus came and took us to the starting point of the air balloons. It was an impressive spectacle to watch the balloons being lightened up by fire. Soon after we entered the basket we got off into the still dark sky. Around us was the noise of hundreds of other hot air balloons in the air. The landscape with its characteristically fairy chimney rocks was spectacular, especially when the sun rose and the scenery was covered in the warm morning light. A rough landing due to windy weather conditions was rewarded with a glass of champagne. Afterwards we hiked through one of the beautiful valleys and visited an old Christian church built inside the rocks. We also visited an over a thousand-year-old underground city used by early Christians as hideouts in Cappadocia. The tunnels of the impressive cave-city contained bedrooms, living rooms, stables, cellars, storage-rooms, churches and wineries. Particularly interesting was the ventilation shaft that was also used as a well to protect the citizens from poisoning during raids. 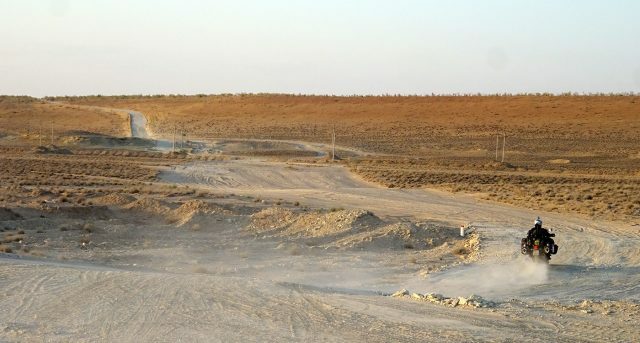 After a few days we left Cappadocia during a sand storm to drive north towards the Black Sea. 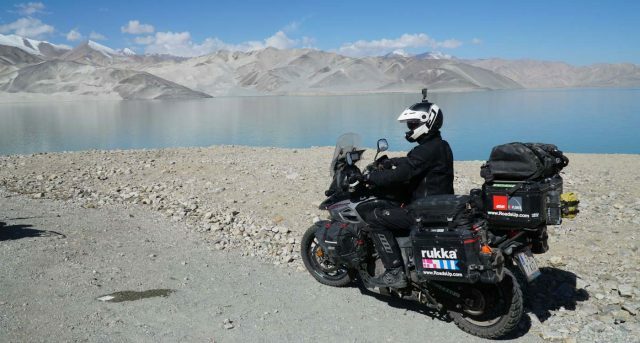 The curvy road through the mountains next to rivers with crystal blue water was a wonderful motorcycle riding experience. 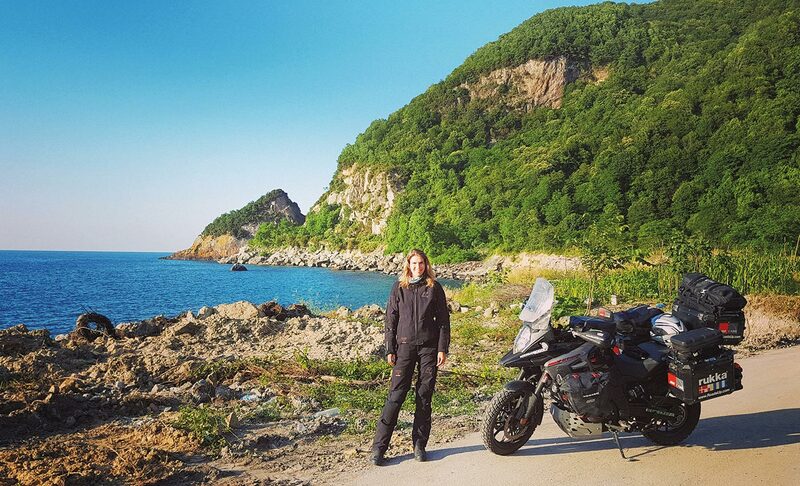 We were really surprised that instead of beautiful beaches there was a big highway located directly at the coast of the Black Sea. After two nights in the tent at the coast we said goodbye to a country that really impressed us due to its friendly people and stunning nature. Turkey has it really all.